Zieleniec Ski Arena is a ski resort where the representatives of the youngest generation of ski fans are most welcome! Each year we warmly welcome and invite everyone who have already gained their first cuts on the board but, above all, all those who are only taking their first steps in skiing or snowboarding and wish to improve their skiing skills. Perfectly prepared and constantly improved infrastructure as well as long, smooth and property profiled slopes create ideal conditions for an effective learning how to ski for almost 150 days a year. All the more, when during the training we may select harder routes each time, thanks to which the learning gains its momentum. 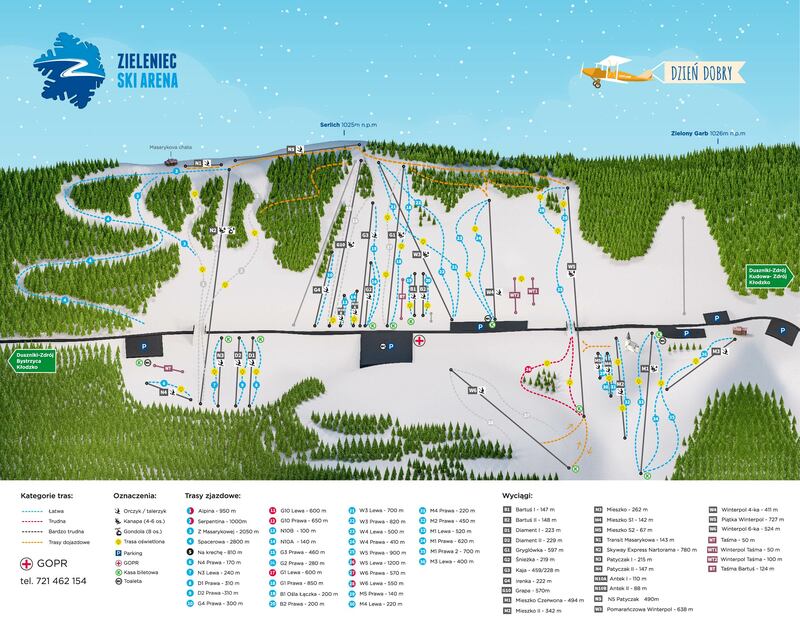 Among the 29 Zieleniec ski lifts and chairlifts, there are 4 didactic lifts at the disposal of the youngest, which are a perfect solution for the beginners. One of them is available in Nortorama which is 50 meters long; the second one is in Bartuś (124 meters long) and two remaining didactic ski lifts are located at Winterpol resort (50 and 100 meters long respectively) enabling fast and, what is the most important, safe transportation for the representatives of the young generation. All slopes located by these ski lifts are adequately prepared, snowed, with the highest diligence and care for safety of the youngest skiers. Zieleniec Ski Arena is not just a skiing infrastructure. It also stands for a rich offer of skiing schools, the representatives of which will not only appropriately train each young skier, but they will also assist in adequate mental training for enjoying this fascinating sport in terms of safety and proper use of slopes. Full list of ski schools and their detailed offer may be found in the tab dedicated to these schools. The cycle of tournaments of the Children Orlica Cap the XXIII edition of which will be held in the 2017/2018 season, is one of the most significant events organized each year in Zieleniec. It is also one of the oldest events designated for the youngest ones in the region, attracting at every occasion several dozen participants, both female and male, at various ages. There is only one main objective of organizing the whole venture-exercise and fresh air activity with a hint of sport rivalry. The entire cycle consists of five tournaments throughout the season and the grand finale at its end.